My favorite meals are the ones that are simple but interesting to cook, and comforting but exciting to eat. The dishes that grant a few precious minutes of hands-off time to sit down, relax, chat with loved ones, or just sip a glass of wine before tucking into dinner. 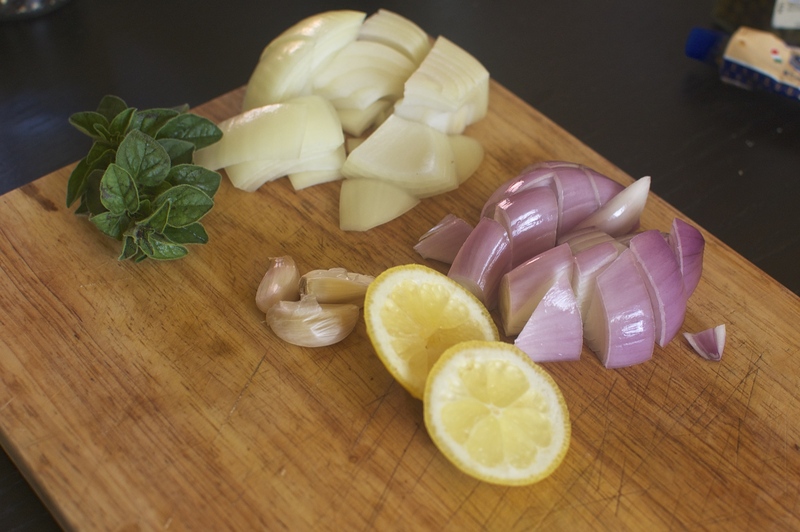 I especially like learning a new technique and many ways of applying it to my favorite ingredients. Braising is a fairly new cooking skill for me. My mother uses the technique often and well, in her epic stews and carrot and meat tsimmes, but I never seemed to pick up on it. The hardest part is searing the meat. I am impatient, you see, and under-sear the meat. The impatience adds up with my chronic assumption that the cooking is taking too long. I end up with soggy but dry meat and heartbreak (and wine intake) takes over. 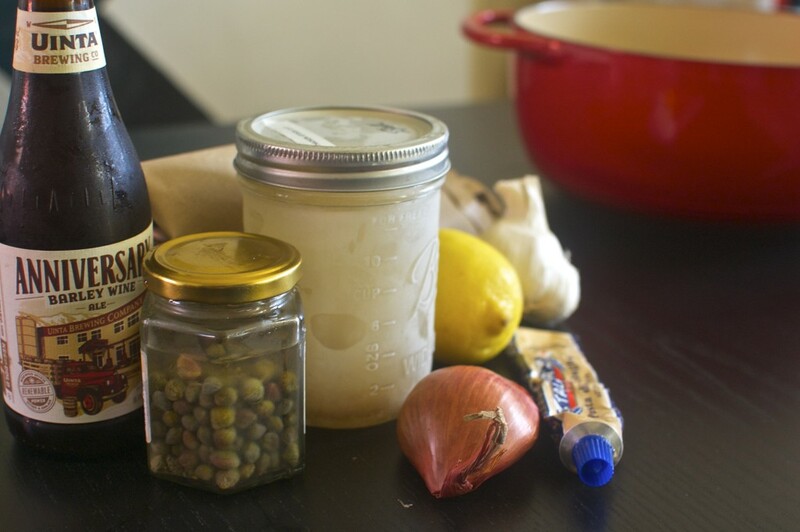 I assembled my favorite flavors – shallot, onion, and garlic; and pungent salty things like anchovy and capers. 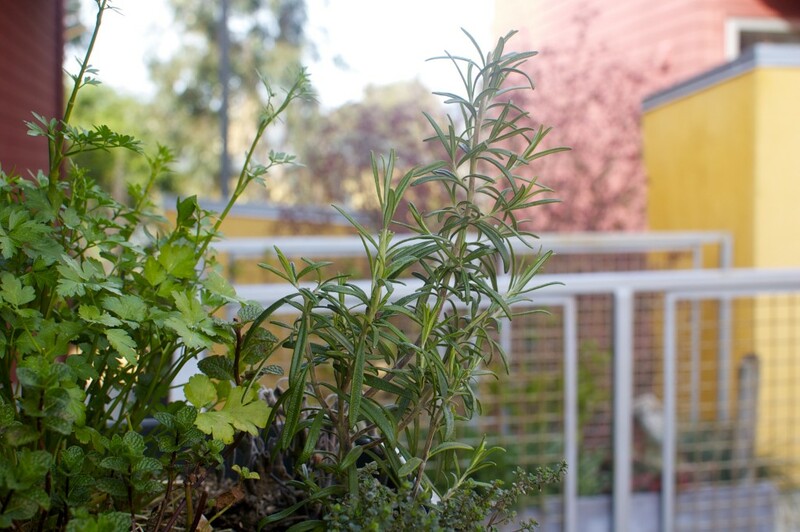 I picked some fresh oregano from our planter box. I selected an alcoholic beverage to sip… er… add to the braising liquid – usually wine but in this case (getting rid of chametz before Passover) a super strong, dark barley wine. Our local butcher occasionally has lamb bacon, a whole new flavor-profile for me. 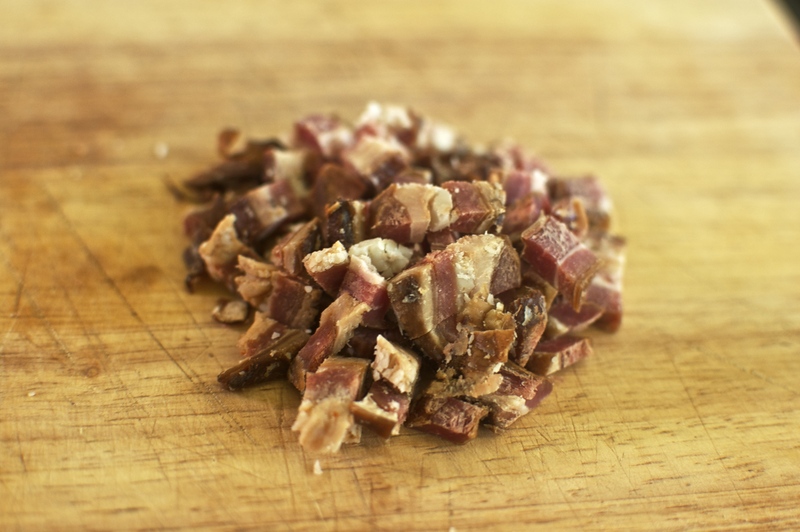 I chopped a few thick slices into chunks to add smokiness and glorious fat to the braise. Everything else being ready and in its place, I began the searing. I repeated my mantra “Leave it in. Crispy skin. Leave it in. 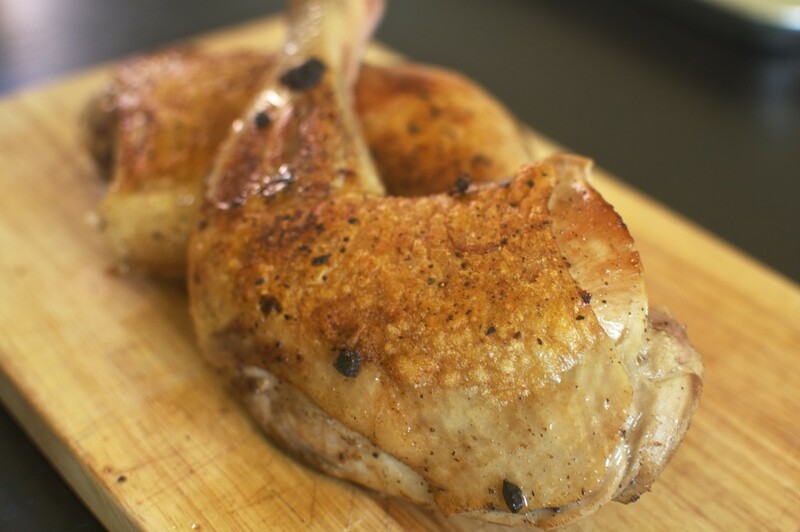 Crispy skin” and when the searing was over, the chicken looked good enough to eat. 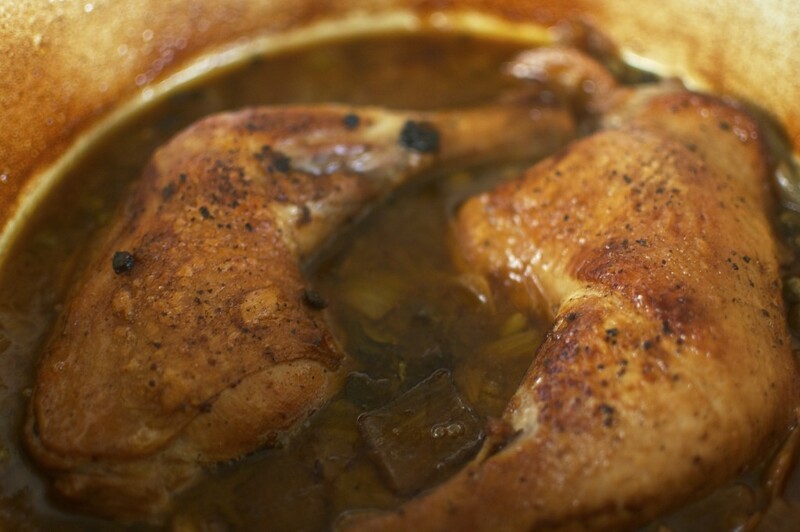 The braising liquid came together quickly, and I settled the beautiful chicken legs on top of it. The whole pot went into the oven, as did a tray of cauliflower, and I sat down, put my feet up, and drank the rest of the barley wine. The meat was tender and flavorful, the sauce plentiful and full of my favorite umami-infused things, and the cauliflower soaked it all up. 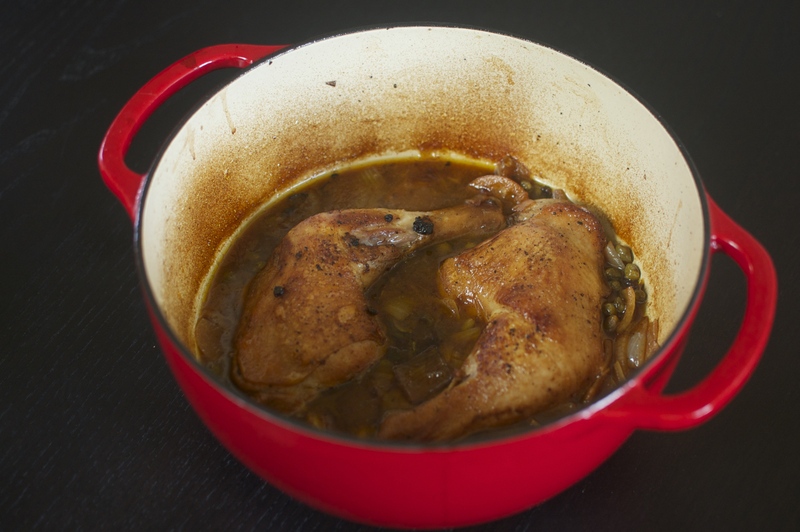 The best part of braising is using my enameled cast iron dutch oven. Her name is Hot Mama, she is gloriously red, sturdy, and up for culinary adventure! This one was a birthday gift from a lovely friend, and I adore it so much. I love the romance of presenting food in such a beautiful and practical pot. The Le Creuset version is stunning, but very much out of my budget. The Sweet Home (a fantastic consumer goods review site) named the Lodge version the best on the market due to the quality and price. Passover is coming! If you want to make something like this for Passover, just use wine instead of the barley wine! Place two oven racks in the lower third of the oven. Turn the oven to 350°F, 175°C. 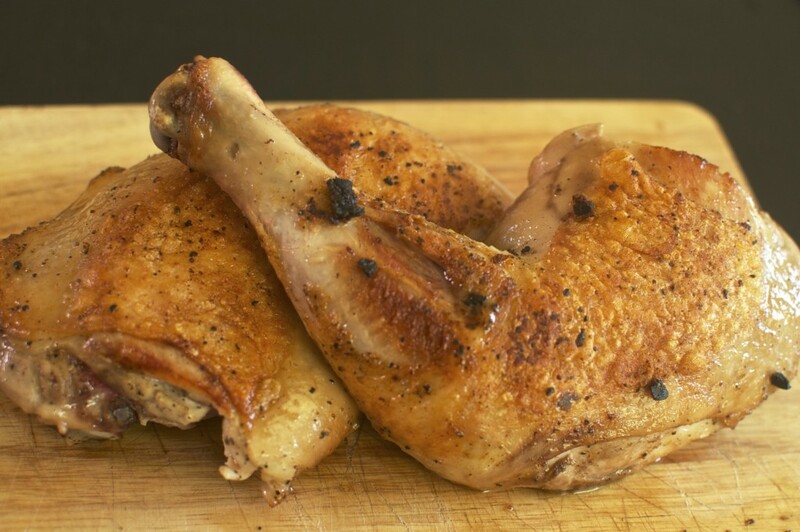 Pat the chicken legs with paper towel to dry them thoroughly. Then season enthusiastically with salt and pepper. Place the bacon in an oven-safe pot or dutch oven (such a deal!) on the stovetop over medium high heat, stirring occasionally, allowing the fat to render than meat to cook. Remove with a slotted spoon. Add a small gentle splash of olive oil to the leftover fat. OR Heat the pot over medium high heat, then coat the bottom of the pot with olive oil, allowing a few moments for the oil to heat up. Sear the chicken legs generously all over in the pot, starting with the largest skin portion. 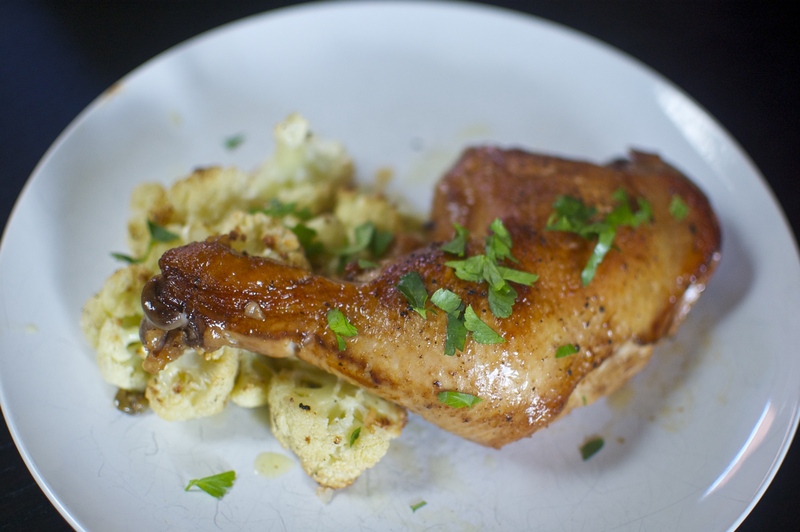 Repeat the mantra "Leave it in, Crispy skin," until the skin is very crispy indeed. If you are using more than two legs, do this in batches to keep the chicken from overcrowding. Remove chicken to a plate or tray. Add more olive oil to the pot, allowing it to heat up again, and add the onion, whole cloves of garlic, and chunks of shallot. Cook until the onion starts to become translucent, stirring frequently. Add tomato puree, oregano, and anchovy paste, stir for two minutes. Pour in barley wine, allowing it to heat up, let it simmer for 5 minutes. Pour in stock and bring up to a simmer. Spread the cauliflower on a baking tray (this is the best one I have ever used) lined with parchment paper. Drizzly lightly with olive oil and season with salt and pepper. Place tray on the lowest rack in the oven. When the braising liquid is bubbling, remove the pot from the heat, place the chicken legs and optional lamb bacon on top, and place on the higher rack in the oven. Remove the pot and tray of cauliflower from the oven after 30 minutes. Let them sit for 5-10 minutes, then pile cauliflower on plates, place a chicken leg on each plate, top with sauce and chopped parsley.